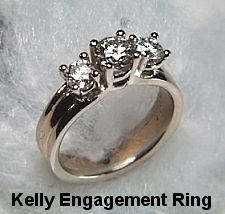 Unique Custom Made Engagement Rings: "KELLY"
Description: The 'Kelly' is an intricate, three strand mounting for 3 stones. The 6mm wide ring mounting will accommodate most any size, shape and color center stone with smaller side stones. 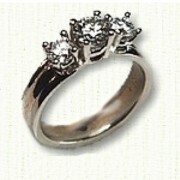 Available in 14kt, 18ky, two tone and platinum (pricing). Visit our Available Diamonds and Gemstones page to view photos of in stock stones.